/ Modified may 14, 2013 6:25 a.m.
Gov. 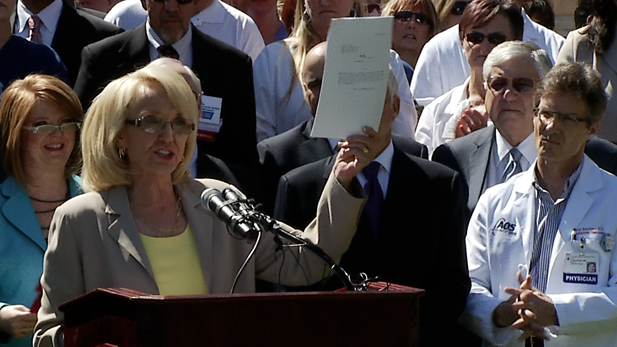 Jan Brewer shows off her 7-page Medicaid expansion bill at March 12, 2013 state Capitol rally. Arizona Gov. Jan Brewer will hold another rally at the state Capitol in Phoenix Wednesday to pressure lawmakers into approving her plan to expand Medicaid. The rally on the House lawn will be the fourth the governor has attended since she announced in January she wants to expand the state's health insurance for the poor to 300,000 more people. Brewer also has a Medicaid support gathering tentatively planned in Tucson for next week. The proposal has put the governor at odds with her fellow Republicans in the Legislature, many of whom say they oppose the plan because of the uncertainty of federal continuance of the funding and the added debt it will bring about. Brewer has said it will bring billions into the state, provide health insurance for poor Arizonans and not cost state taxpayers anything because the state's share will be paid by hospitals. Without it, she has warned, hundreds of thousands won't be covered and 63,000 could lose coverage they have now. The proposal and the state budget for 2013-14 are essentially in limbo until a deal is struck. Brewer has said she will not sign a budget without the Medicaid expansion provision, and the Arizona Republic reported last week that she told legislators not to send her any more bills before dealing with it. Several media outlets, including the Republic, have reported in recent days that House Speaker Andy Tobin, R-Paulden, is working on an alternative to Brewer's proposal and is trying to gather support for it in the House. Tobin hasn't revealed details, although he previously said he was opposed to expansion in the form Brewer presented it. Medicaid expansion is part of the Affordable Care Act. Brewer was among the governors who sued to block the law, but the U.S. Supreme Court upheld it last year. The governor proposed Medicaid expansion when she gave her State of the State speech in January. She called it one of the most difficult decisions of her tenure, saying she accepted that the Affordable Care Act is the law of the land and the state should take advantage of it.